St. Cecilia Music Center (SCMC) is proud to present The Lone Bellow in their new “Triiio Tour” on November 29, 2018 at 7:30 p.m. The Lone Bellow “Triiio Tour” features the three key members of The Lone Bellow - Zach Williams, Brian Elmquist and Kanene Donehey Pipkin in an acoustic concert. Concert tickets for The Lone Bellow "Triiio Tour" are $30 and $35. All concert tickets can be purchased by calling St. Cecilia Music Center at 616-459-2224 or visiting the box office at 24 Ransom Ave. NE. Tickets can also be purchased online at www.scmc-online.org. A post-concert “Meet-the-artist” party with a cash bar will be offered to all ticket-holders giving the audience the opportunity to meet the artists and to obtain signed CDs of their releases, as well as, other promotional items offered by the band. St. Cecilia Music Center (SCMC) is proud to present The Lone Bellow in their new “Triiio Tour” on November 29th at 7:30 p.m. 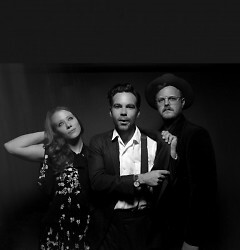 The Lone Bellow “Triiio Tour” features the three key members of The Lone Bellow - Zach Williams on guitar and vocals, Brian Elmquist on guitar and Kanene Donehey Pipkin a multi-instrumentalist. 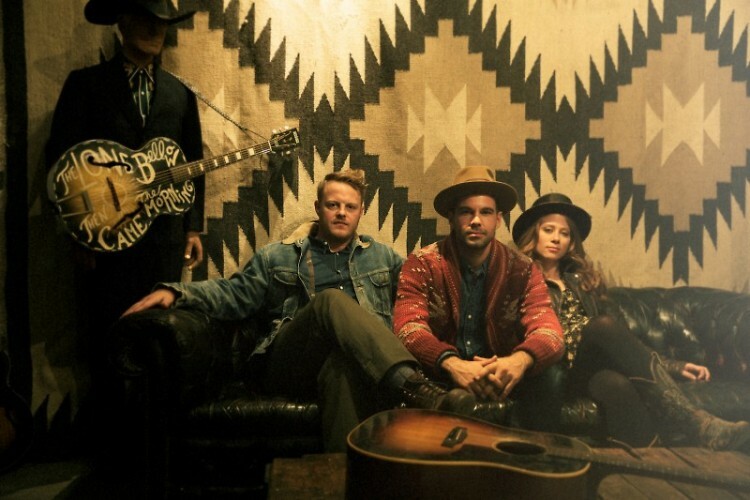 The Lone Bellow is on a major North American Tour throughout the United States and for the first time, the band is playing as a trio with no back up band – riffing on a wildly popular portion of their previous live shows where the trio would gather for a couple of songs in an intimate acoustic performance. The “Triiio Tour” is a live presentation of their recently released album on October 19th, Restless EP, that features new songs, two covers, and three reworked versions of songs from previous records. The Lone Bellow began as a Brooklyn-based band. They moved to Nashville in 2016 and have become widely known for their transcendent harmonies, serious musicianship and lively performances. It all started with the idea of the “Triiio tour” a one mic tour, says Zach Williams. “Since we released our first album in 2013, we’ve been setting a few songs aside every night to sing together around one mic, and those times have become some of our most memorable musical moments of touring together. The response to those acoustic sets have been so powerful, that we decided to put together an entire tour all around that one microphone. In the spirit of…the tour, we were prompted to make a record that would capture that feeling, and to make it ourselves. We had never done that before. We ended up making it in Jason and Kanene’s attic along with all of the natural sounds of that space: floors creaking, birds chirping, babies crying, lawnmowers running. It was a joy to make.” October 2018, they completed their fourth album, Restless EP, an acoustic album celebrating their most cherished touring moments. The album, produced by Brian Elmquist and Jason Pipkin, includes new songs, two covers, and three reworked versions of songs from previous records. Concert tickets for The Lone Bellow are $30 and $35. All concert tickets can be purchased by calling St. Cecilia Music Center at 616-459-2224 or visiting the box office at 24 Ransom Ave. NE. Tickets can also be purchased online at www.scmc-online.org. A post-concert “Meet-the-artist” partywith a cash bar will be offered to all ticket-holders giving the audience the opportunity to meet the artists and to obtain signed CDs of their releases, as well as, other promotional items offered by the band. Long before they combined their voices, the three members of the Lone Bellow were singing on their own. Brian Elmquisthad been writing and recording as a solo artist for more than a decade, with three albums under his own name. Kanene Donehey Pipkinand her husband Jason Pipkin were living in Beijing, China, hosting open mic nights, playing at local clubs and teaching music lessons. Zach Williams began writing songs in the wake of a family tragedy: After his wife was thrown from a horse, he spent days in the hospital at her bedside, bracing for the worst news. The journal he kept during this period would eventually become his first batch of songs as a solo artist. Happily, his wife made a full recovery. When Kanene’s brother asked her and Zach to sing “O Happy Day” together at his wedding, they discovered their voices fit together beautifully, but starting a band together seemed impossible when they lived on opposite sides of the world. Brian soon relocated to New York and Kanene moved there to attend culinary school a couple years later. The three got together in their new hometown to work on a few songs of Zach’s, he’d been chipping away at the scene as a solo artist for a while by then. After hitting those first harmonies they decided to abandon all other pursuits. Soon the trio was playing all over the city, although they considered Rockwood Music Hall on the Lower East Side to be their home. They opened for the Civil Wars, Dwight Yokam, Brandi Carlile and the Avett Brothers, and their self-titled debut, produced by Nashville’s Charlie Peacock (the Civil Wars, Holly Williams) and released in January 2013, established them as one of the boldest new acts in the Americana movement. The album appeared at No. 64 on the Billboard 200.People named it No. 8 of the Top 10 Albums of 2013and Entertainment Weekly said it was "One of the top reasons to love country music in 2013". The album was featured on 10 different Best of 2013 year-end lists. After two hard years of constant touring, the band was exhausted but excited. By 2014, they had written nearly 40 songs on the road and were eager to get them down on tape. After putting together a list of dream producers, they reached out to their first choice, the National guitarist Aaron Dessner, who has helmed albums by the L.A. indie-rock group Local Natives and New York singer-songwriter Sharon Van Etten. Their victorious release,Then Came The Morning produced by Aaron Dessner, was nominated for an Americana Music Awardand helped create a large dedicated fan base. Subsequently, the band appeared on "Jimmy Kimmel Live," "LateShow With David Letterman," "Conan O'Brien," "CBS This Morning," "Later...with Jools Holland," and "The Late Late Show With James Corden" in support of the album. Dessner and the Lone Bellow spent two weeks recording at Dreamland in upstate New York, a nineteenth-century church that had been converted into a homey studio. The singers found the space to inspire the emotional gravity necessary for the material and the acoustics they were looking for. The Lone Bellow's third album, Walk Into A Storm was released inSeptember 2017. It was created to carry on in the warmly soaring tradition of The Lone Bellow's most apparent influences, most notably Glen Hansardand his idol Van Morrison. The album was produced by Dave Cobb, the superstar Americana producer who's presided over major albums by Chris Stapleton, Sturgill Simpson, Jason Isbell and others. Béla Fleck & Abigail Washburn will be returning to SCMC on February 9, 2019. “The king and queen of the banjo”first appeared together on stage at SCMC this past February 2018. With a strong fan base in Grand Rapids, SCMC is delighted to bring the two of them back for an encore performance. Béla Fleck is a fifteen-time Grammy Award winner who has taken the instrument across multiple genres, and Abigail Washburn is a singer-songwriter and clawhammer banjo player who re-radicalized it by combining it with Far East culture and sounds. The Milk Carton Kids will perform at SCMC on February 28, 2019. Nominated in 2015 for a Grammy for Best American Roots Performance, Best Folk Album of the year in 2013, and winner of The Americana Music Association for Best Duo/Group of the year in 2014, The Milk Carton Kids just released a new album on June 29, 2018 from ANTI-Records entitled “All the Things That I Did and All the Things That I Didn't Do. Asleep at the Wheel will return to SCMC on April 11, 2019. Over their history, Asleep at The Wheel has earned ten GRAMMY Awards and released more than 25 studio and live albums, and there is no sign of them slowing down any time soon. The band’s release, Still the King: Celebrating the Music of Bob Wills and His Texas Playboys, garnered the 2016 GRAMMY Award for Best Recording Package.New Routes, their brand-new album released in September 2018, marks both a new path forward and a nod to their freewheeling roots as one of Texas’ most beloved bands. Guitarist Leo Kottke will return to SCMC on April 18, 2019. Over his many years of writing and performing, Kottke has composed scores for film soundtracks, children’s shows, and a symphony, as well as, released many albums. Focusing primarily on instrumental composition and playing, Kottke also sings sporadically, in an unconventional yet expressive baritone. In concert, Kottke intersperses humorous and often bizarre monologues with vocal and instrumental selections played solo on his 6- and 12-string guitars. 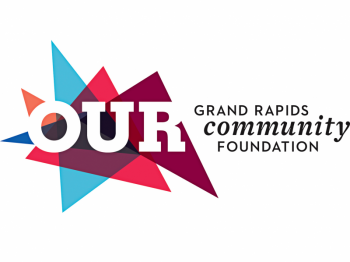 Additional concerts within the Jazz Series and the Chamber Music Society of Lincoln Center Series highlight SCMC’s 2018/2019 season celebrating their 135-year history as the oldest performingarts organization in Grand Rapids and West Michigan.